Do you dream of an exotic African safari? African Palace Online Casino offers plenty of deposit bonuses and cash outs that could make your dreams come true. While playing, users may not get the anticipated feeling of an African Palace, but with so many huge jackpots and promotional bonuses, you may be on your way to the Sahara for real! Choose from among 11 categories of online casino games illuminated with colorful, high-quality graphics and unique themes including an Iron Man Video Slot and a Haunted House Classic Slot which keep the gaming experience interesting and exciting. However, the casino theme lacks cohesion, and gamers will be disappointed if they’re expecting a walk on the wild side through an African safari. 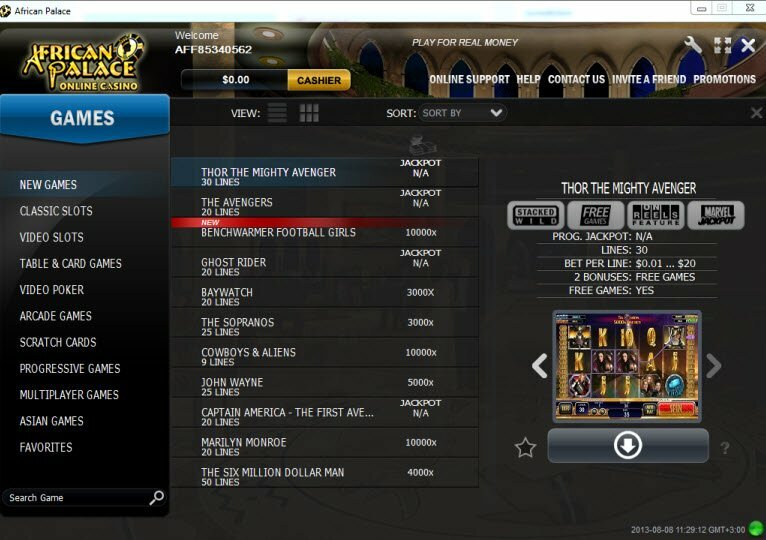 Playtech software powers African Palace Casino with over 250 games available on the site. Although the African Palace software downloads quickly and easily, many of the games require an additional download which may frustrate impatient users. 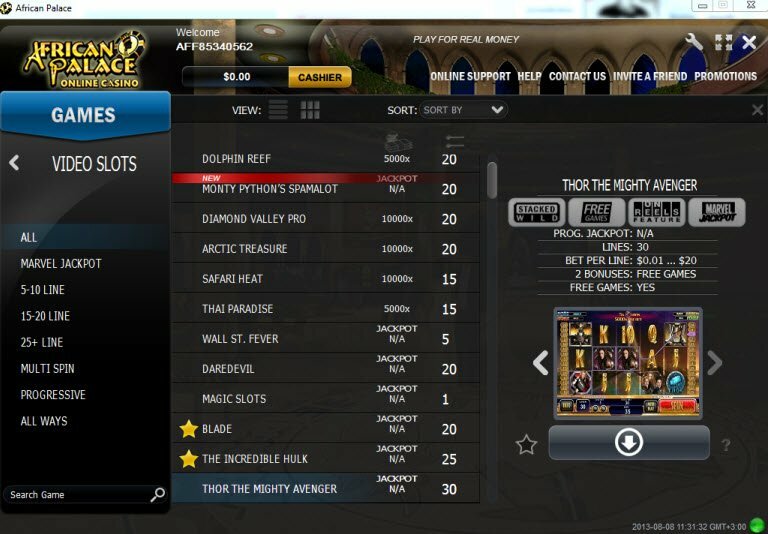 Choose from among 11 categories of online casino games illuminated with colorful, high-quality graphics and unique themes including an Iron Man Video Slot and a Haunted House Classic Slot which keep the gaming experience interesting and exciting. Lions and Tigers… and Major Cash Prizes! African Palace Casino offers four deposit bonuses depending upon how much of a risk you’re willing to take. The first matches up to 200% up to 200, the second matches 50% of up to 150 free, the 3rd matches 75% of up to 100, and the 4th matches 100% of up to 50. Take advantage of all four and cash in big. African Palace Casino takes it to the next level by offering many exciting promotions including a five day luxury safari to Africa. Every Tuesday, the casino hosts a Happy Hour special between 8pm to 11pm in which you can play in the casino and receive up to 50% for every deposit. African Palace Casino offers a large array of popular payment methods including Visa/MasterCard, POLi, Neteller, Skrill, UseMyFunds, and Ukash. 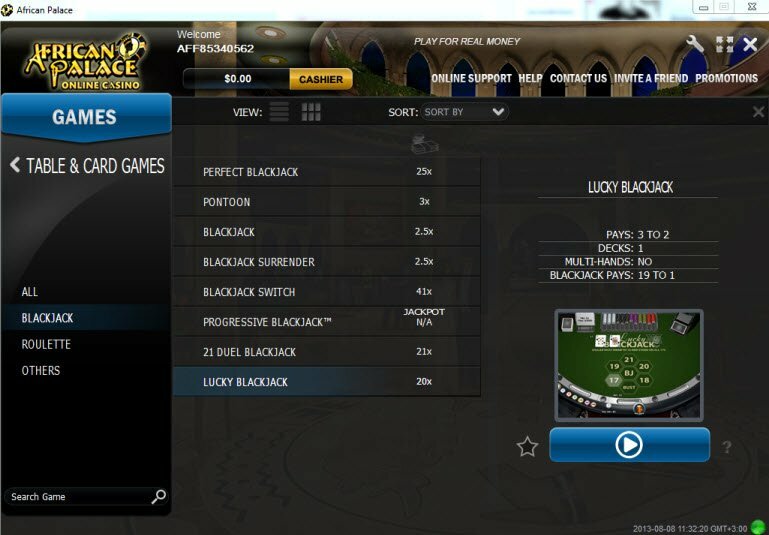 This online casino also accepts payments from a number of different countries and currencies including the UK, USA, Canada, Australia, and New Zealand. African Palace Casino offers 24/7 customer support available in Australia, Canada, New Zealand, the United Kingdom, and internationally via online chat, phone, or email. When I sought online support through the casino interface, a customer service representative immediately attended to all of my questions and concerns. Not only did I enjoy playing at this casino, it also seriously made me want to visit Africa!